Our previous post was about forex technical analysis with Coppock Curve. This post explains the technical analysis technique with Darvas Box.This technical analysis indicator was developed by Nicolas Darvas, who made millions of Dollar trading stocks. We can apply this indicator to trade forex. Darvas Box technical indicator has an upper line and a lower line, here we have blue line and red line respectively. The signals are found with the breakouts of the upper and lower lines. If the upper line breaks out, it signals to go long, and if the lower line breaks out, it signals to go short. If you know the fractals breakouts, then Darvas Box breakouts will be easy to understand for you. To understand the Darvas Box breakouts, carefully look at the horizontal straight portions of the upper and lower line. When a horizontal straight line appears in the upper line, it is considered as a resistance level, in other way, when a horizontal straight line appears in the lower line, it is considered as a support level. General principle says that a buy order should be placed when the resistance level is broken out, and a sell order should be placed when the support level is broken out. 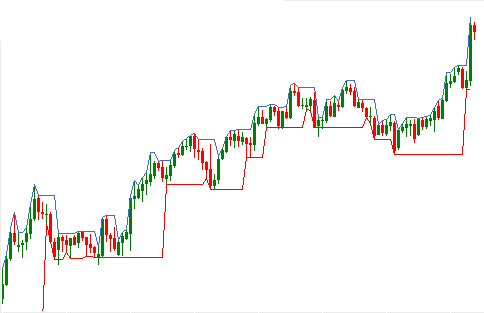 This principle is also applicable in case of technical analysis with fractals, another forex technical analysis tool as Darvas Box. Another key interpretation is that when the price reaches to the horizontal lower straight line,currency pair will have support and may be pushed back, similarly when the price reaches to the horizontal upper straight line,the currency pair may be pulled back. A buy order when a upper line is broken out. A buy order when price reaches to lower straight line. A sell order when a lower straight line broken out. A sell order when the price reaches to upper straight line. Dear traders, hope this post will help you to understand the forex technical analysis with Darvas Box. If you have any suggestion, please drop a comment below.